Mechanical Low Back Pain is the most common ailment we see in physiotherapy. It often masquerades as pain in the buttock or “sciatica”. Low back pain affects nearly everyone at some stage of life. 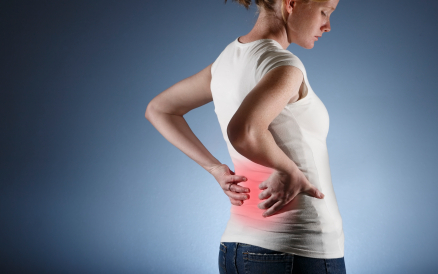 60-75% of patients that have back pain once will experience recurring problems. The majority of back pain is MECHANICAL. That simply means that there is a problem with the moving parts of the spine. The tissues affected may be the: discs, ligaments, muscles, nerves, or cartilage. Mechanical pain arises when the soft tissue between two joints of the spine has been over stretched, gets locked up, or in some cases torn. It may start with an incident or for no apparent reason. The pain will be caused or affected by certain positions or movements. According to that logic, it will typically respond well to specific positions or movements. The patient can learn to do these maneuvers themselves, though some “hands-on” by the therapist may be needed to get things started. If you bend your finger backwards far enough you would feel uncomfortable, and if you immediately released the pressure, the pain would be abolished and no damage will have occurred. If however, you did not release the pressure, eventually, there would be some tissue sprain and damage such that even when you released the pressure, the pain would still be present. In simple cases, healing takes only a few days but if you continued (knowingly or unknowingly) to apply that pressure daily, the soft tissue would not have a chance to heal and pain would persist. The same thing happens in back pain. We tend to rest prolonged in poor posture (slouching) or bend too much and our problems continue. There are many other injuries that can cause back pain but a vast majority can be prevented and or corrected by addressing the above factors. We take our car to the mechanic when the moving parts need fixing, and we should take our bodies to a physiotherapist when our moving parts need fixing. Just as an auto mechanic will diagnose the problem and propose a solution, a physiotherapist will do the same for your pain. A mechanic does not figure out what is wrong with the car by taking a picture of the engine, and a physiotherapist also does not depend on a picture (ie X-Ray, MRI) to figure out what is wrong with your back. These diagnostic tests are one piece of the puzzle but X-Ray and MRI are static and are not as helpful as many believe to diagnose a problem with movement. Taking care of your car is your responsibility just as taking care of your body is YOUR RESPONSIBILITY. Self management and treatment of low back pain is now widely accepted. At Bonavista Physical Therapy, you will be taught how treat your back pain yourself. It will be more effective in the long run than ANY OTHER TREATMENT. Truly effective treatment is treatment that you eventually need less often, not something that you need on an ongoing basis. Your physiotherapist will take a very detailed history regarding your onset, duration, irritability, intensity, location, aggravating and easing factors of your symptoms. A physical assessment of your movement and limitations will also occur. If at this point, the physiotherapist feels the problem is NOT mechanical or musculoskeletal, they will refer you back to your physician to rule out other pathologies. Once the physical therapist has determined that you have mechanical pain of musculoskeletal origin, we will explain the anatomy and cause of the pain and begin treatment aimed at helping you manage and prevent future episodes. You can expect to be given some simple movements or postures that will help reduce the mechanical strain on your tissues, and promote healing. Most patients start noticing decreased pain and increased range of movement on the first visit. Our goal is that improvements should be obvious by the third visit. Treatment may also include: core exercises, ergonomic and lifting advice, manual therapy, acupuncture or other modalities. The focus is to get you moving comfortably again and to be able to self-treat for the long term. If we do our job well, you need us less over time, not more. To book a Back Pain Pysiotherapy or Physical Therapy appointment in Calgary, please contact Bonavista Physical Therapy, appointments always available.